This Tool is for Tool developers tired of the chores involved with setting up new Tools or zipping a new XRNX file after an update. This Tool also helps new Tool developers getting past the first few hurdles of the Renoise Lua scripting API. 2 menu items will be added to the File Menu of the Scripting Editor. Once activated you are guided through a form that creates the folder, main.lua and manifest.xml for you. New Tools will be created within a __MyTools__ subdir, so you can quickly find the Tools you have created. Main.lua is a simple template with a menu item and an example dialog, serving as a starting point. Note: you will need to 'Reload all Tools' before the newly created Tool pops up in the menu. 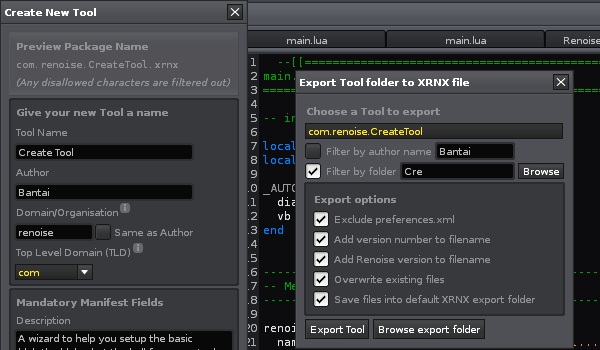 The Export feature packages the chosen Tool into an XRNX file ready for distribution. For some reason .svn and .DS_Store folders are magically excluded; consider it a free bonus feature. Version 7 brings lots of cool stuff to the Export Tool Tool. It's now possible to filter Tools by author, folder or file name. There is also a new option to automatically exclude that pesky preference.xml file. Now exports Tools for API 3. Also warns against exporting AutoUpgraded Tools. You should check those Tools and remove the AutoUpgraded flag. The Version number field in your Tool's manifest.xml will be autoformatted to max. 2 decimal digits. The Create Tool Tool and Export Tool Tool is brought to you by Salaryman Man.